Have you ever bored with the chore? How often is there too much to do with the chore but not enough time to do it? Diggro KK320A1N Robotic Vacuum Cleaner can help you. It features the side brushes, 900pa strong suction power and wet moping, which is great for cleaning hair and delivers the thorough and complete cleaning performance. It has the Gyroscope Navigation system which can detect the automatic cleaning route can make the cleaning more efficient and thorough without repetition or omission. The installed HEPA can help to protect you from hair allergy. The powerful 1200mAh battery ensures 60min continuous working time. What's most amazing is it supports automatic charging. Such a smart robotic vacuum cleaner will definitely allow you to enjoy the modern comfortable and clean home! Therefore, you deserve it. •4 Cleaning Modes: There are 4 available modes to clean: powerful mode, automatic mode, edge mode and random mode, it will automatically navigate in a methodical pattern, making sure it covers every area of your home. •900Pa Powerful Suction: With 900Pa powerful suction mechanism and sweeper brushes, KK320A1N is able to sweep (dry) and mop (wet) individually or simultaneously, depending on your needs. •330ml Large Capacity Dust Box: Equipped with 300 large capacity of dust box, it can accommodate more garbage, easy to clean up more areas. With HEPA installed to protect you from hair allergy. •Automatic Recharging: Automatically returns to the charging dock and recharges itself when running low on power, works up to 60min, covers 100-200 square meters. •Anti-Drop and Anti-Collision Sensors: The frontal sensors will detect and scan the ground, preventing the bot from falling down the stairs as well as will detect walls to avoid bumping into them. When it identifies these risks, the T370 will redirect its way to clean elsewhere. •Obstacle Climbing and Low Profile Design: The large wheels are specially designed to work on the rough floor, with its 15 degrees slope angle, it can climb over your rugs and carpets. This robot measures 335 mm x 80 mm, thanks to its low profile it can clean under the bed, around the clutter, along with the wall side and any other areas that are hard to reach. •Quiet Clean: When the machine is working, the noise is less than 60dp, so it will not disturb your rest or affect your daily life. •Powerful Long Lasting Battery: Built-in 14.4V, 1200mAh Li-ion battery, the charging time is 3 -4h, the usage time is up to 60min, allows you to clean the room without worrying about the battery. •Intelligent Design: For bottom scraper design will help you clean your home. •Flexible and Convenient: 8.5cm ultra-thin body, more flexibility, can clean more space. 1. Do not use the product in suspended environment without the protective guard so as to avoid accidental fall of the robot and personal injury. 2. Do not use the product to clean sharp objects like glass or nails to avoid damage to the product. 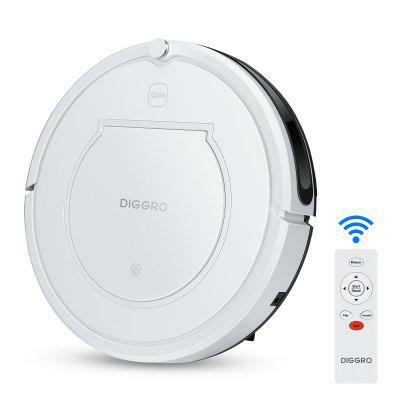 Want to be notified when the Diggro KK320A1N Smart Cleaning Vacuum Robot Machine 4 Cleaning Modes gets even cheaper? Make sure you snag the best price by entering your email below. We'll email you when the price drops, free! We're tracking the price of the Diggro KK320A1N Smart Cleaning Vacuum Robot Machine 4 Cleaning Modes every day so you know if that deal is really a steal! Check back for to check the best price for this product - and whether its current sale price is really the cheapest it's been! No Diggro KK320A1N Smart Cleaning Vacuum Robot Machine 4 Cleaning Modes coupons found!